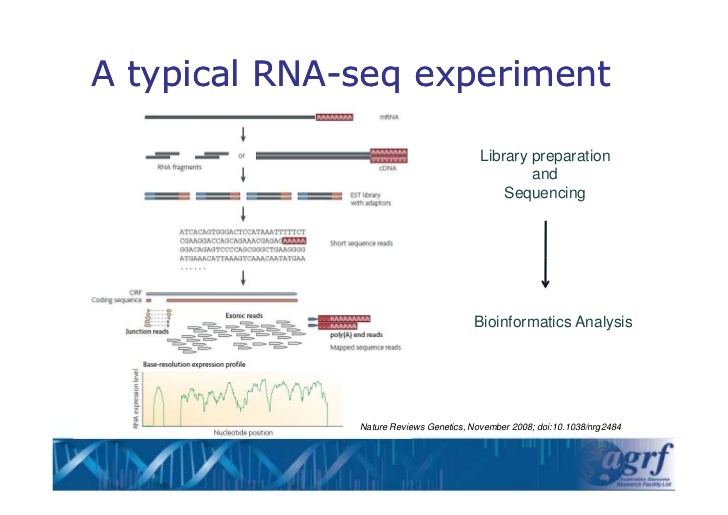 Rna-Sea (sometimes referred to whole transcriptome shotgun sequencing), is a next-generation sequencing method for determining the expression level (i.e., level of RNA, small RNA, miRNA, etc.) in a given sample. As such, it is an indispensable tool for many comparative studies and for elucidating cellular phenomena such as alternative gene splicing, post-transcriptional modifications, and gene fusion. Image credit: Sonika Tyagi, Australian Genome Research Facility. smallwig is a specialized compression algorithm for wig files that contain RNA-seq data. It may be used in the archival mode, in which case the file is compressed using computationally intense methods such as context-tree weighting, leading to near-optimal compression rates; and in the standards mode, which enables access to summary statistics of blocks of data, random access and fast parallel compression/decompression features. smallwig offers significantly better compression rates than standard bigwig, gzip and wig methods, in most cases more than an order of magnitude (most test examples were files from the ENCODE project). The compression rate and running time both in standard mode and random query mode are shown in the following figures. Zhiying Wang, Tsachy Weissman, and Olgica Milenkovic, “smallWig: parallel compression of RNA-seq WIG files”, Bioinformatics, 32(2), pp.173-180, 2016. For questions, please contact Zhiying Wang (zhiying@uci.edu) and Olgica Milenkovic (milenkov@illinois.edu). You may access the source code for smallwig and the README file from github, here. The README file instructions are summarized below.